This two-day interactive workshop begins with the principles of SAFe, Lean-thinking tools, Agile development practices at scale, and an overview of the Scaled Agile Framework. Teams will then learn the Product Manager and Product Owner roles in the enterprise, how to manage the enterprise backlog, delivering features, agile requirements, the events within SAFe, and finally, stakeholder management. At the end of this workshop, attendees will have the tools and knowledge they need to write Epics, Features, and User Stories within the Scaled Agile Framework, and have a solid foundation on how to manage programs in the Lean-Agile Enterprise. 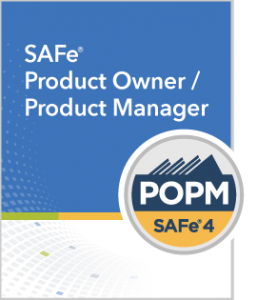 An optional SAFe Product Manager/Product Owner certification is offered at the end of the class. Only applicable for selected batches and courses. We also offer customized solutions, on site training and consulting interventions. For more information please contact us.